SO MANY UPDATES FOR ONLY $99,500. BRIGHT NATURAL LIGHT SHINES THROUGH THE MANY WINDOWS IN THIS FULLY BRICK HOME. KITCHEN OVERLOOKS THE DINING ROOM. FAMILY ROOM PROVIDES ACCESS TO THE FULLY FENCED BACK PATIO. TWO SPACIOUS BEDROOMS UPSTAIRS AND TWO FULL BATHROOMS. MASTER SUITE WITH AMPLE SPACE IN THE 2 CLOSETS. COMPLETE UPDATE IN 2015 FROM THE STUDS IN, HVAC, FLOORING, STAINLESS APPLIANCES, WINDOWS, NEW FENCE AND JUST FRESHLY PAINTED FOR YOU. SECURITY IS YOURS IN THIS BEAUTIFUL GATED COMMUNITY. CENTRALLY LOCATED TO HUNTINGTON BEACH, WALMART, PENINSULA TOWN CENTER SHOPPING AND MOVIES, RESTAURANTS, I-64, I-664, AND JAMES RIVER BRIDGE. Ready to visit 89 Towne Square? Request a free property tour! 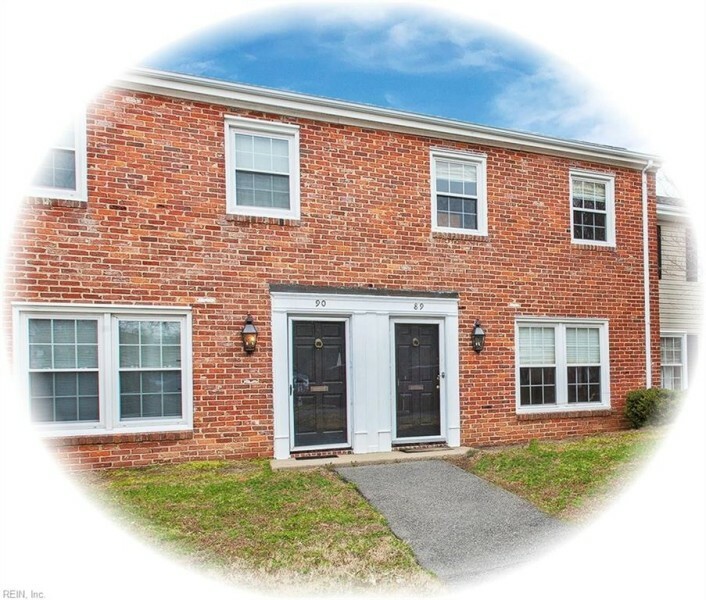 Send me more information about the listing at 89 Towne Square, Newport News, VA 23607, MLS# 10239918. This 2 bedroom, 3 bathroom home located at 89 Towne Square, Newport News, VA 23607 has approximately 1,300 square feet. It is currently listed for $99,500 and has a price per sqft of $7,654. This home is currently Sold under the MLS#: 10239918. This listing is provided by Liz Moore & Associates LLC. 89 Towne Square Drive, Newport News was built in 1970. It has Assigned/Reserved parking.The kitchen includes Dishwasher, Disposal, Microwave, Elec Range, Refrigerator. 89 Towne Square is part of the All Others Area 106 neighborhood located in 23607.